What were the smallest and largest dinosaurs known in the Cretaceous period? It is difficult to determine the smallest dinosaurs known from the Cretaceous period. In general, the smallest herbivorous and carnivorous dinosaurs could be as small as a chicken. Most of the carnivorous ones ate insects as their main supply of food; and, of course, the smallest herbivores ate plants. One contender for the smallest is the Microraptor (meaning “little plunderer”), a bird-like, crow-sized dinosaur from China. This coelurosaurid theropod was about 16 inches (40 centimeters) long. It may have lived in trees, as its feet were perfect for climbing. Another possibility is the Wannanosaurus (named after the Chinese province in which the incomplete skeleton was found). This tiny homalocephalid dinosaur, measuring about 2 feet (60 centimeters) long, was a very primitive pachycephalosaur (related to Pachycephalosaurus and Stegoceras). 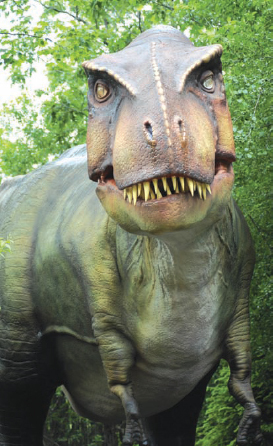 Scientists probably have yet to uncover the largest dinosaurs of the Cretaceous period. One of the largest and most relatively complete skeletons comes from the Brachiosaurus of Tanzania, Africa, which measured up to 75 feet (23 meters) in length. But this sauropod didn’t make it through the Cretaceous. It evolved around the Late Jurassic period and died out by the Early Cretaceous. More recent fossil discoveries may lead to even larger sauropods. One includes a massive herbivorous dinosaur Argentinosaurus huinculensis, a South American sauropod of the Titanosauridae family, measuring between 130 and 140 feet (40 and 42 meters) long. Another contender is the second-largest sauropod so far found, the Paralititan (meaning “tidal Titan”), a titanosaurid sauropod found in Egypt that lived about 100 million years ago. Currently, the largest carnivorous dinosaur from the Cretaceous period seems to be a toss-up between the perennial favorite and several newcomers. The favorite is the theropod Tyrannosaurus, found in North America and Asia and measured over 40 feet (12 meters) in length. The other challengers include: The longest meat-eating dinosaur yet discovered, the 44-to 46-foot-(13.5-to 14.3-meter-) long Giganotosaurus of South America; the Spinosaurus a bipedal carnivore that measured about 52 to 59 feet long (16 to 18 meters) from Africa; and the 26-to 44-feet-(8-to 14-meter-) long Carcharodontosaurus saharicus of North Africa. All of these huge, meat-eating theropods are thought to have been around the same size—and maybe even heavier—than the Tyrannosaurus. One of the largest carnivorous dinosaurs yet discovered is the Gigantosaurus, which lived in what is now South America and was well over 40 feet (13 meters) long (Big Stock Photo).